Furniture should be child-sized to help build confidence and independence. HighScope preschool classrooms are broken up into interest areas that are easily accessible to children and reflect their natural interests. 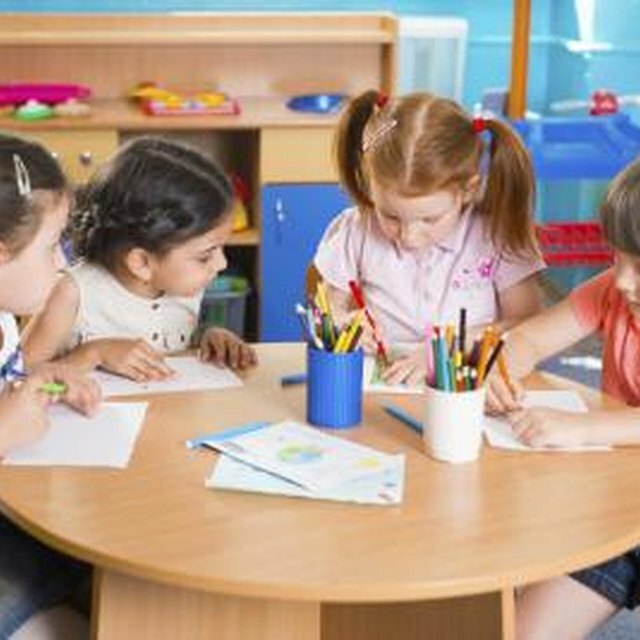 Children are encouraged to interact with each other, the adults in the classroom and the materials in a flexible manner, with flow between the areas encouraged. 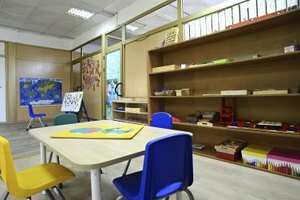 The main idea behind the design of a HighScope classroom, like that of most early childhood spaces, is to encourage growth and learning using the child's natural curiosity and intentional interactions with adults, peers and prepared materials. The block area should have plenty of floorspace. Plan the placement of your subject area centers in your classroom space. Write down the title of each area you plan to create on its own individual index card. Typical High Scope indoor areas include: blocks, art, writing and reading, dramatic play (house), science and math, water and sand. Place these cards around your classroom, arranging and rearranging until you are happy with the flow from area to area. Keep in mind that areas like art may be most convenient near a water source and away from carpet. Make sure children have access to books, even though most of them cannot read yet, in order to build early literacy skills. Position the shelves, tables, furniture and chairs you will need for each area in the designated spaces. 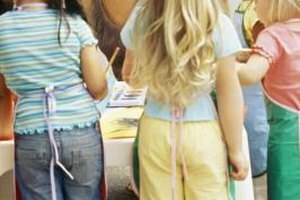 You may want an easel or two in the art area and a play house or kitchen set along with hooks for hanging dress-up clothes in the dramatic play area. Without labels and sufficient shelf space, your classroom shelves will quickly become chaotic. Place the appropriate materials in each area using small shelves and open containers that students can easily take out and replace. Place labels using pictures and words on the material tubs or boxes, with a matching label on the shelf so children can replace what they use successfully. The specific supplies you provide for each area vary from classroom to classroom, but an organized setup will allow the students to access whatever it is you have made available. Evaluate your new setup along with another educator in order to address any shortcomings before the school year begins. Do you need more art supplies? Are there enough engaging activities for every child in your class? Is there enough space in each area to allow children to work together and alone? Make any necessary changes, and continue to reevaluate and improve your room throughout the school year. Student work makes the best final touch to any HighScope classroom. The final decorating touches will come from the children themselves. Use photos of your students, art work and writing they produce and classroom projects to personalize the room throughout the year. Include decorations that coincide with each subject area, as well as your thematic units. If you need inspiration for specific items to place in each area, visit a variety of classrooms in your area to see what they are using. Make sure that at least some of the classrooms are using the HighScope philosophy, but don't worry about pulling in ideas from other schools or thought as well. There is a lot of cross over in early-childhood pedagogy, despite occasionally divisive rhetoric in some education circles. Try not to get really attached to any one set up as you arrange things. our classroom will likely go through many incarnations before the day is done. The children will also add their spin to the room, with or without your help. Jamie Paul has a Bachelor of Science in biology from Northern Arizona University and a master's degree in sociology from the University of Colorado, Denver. 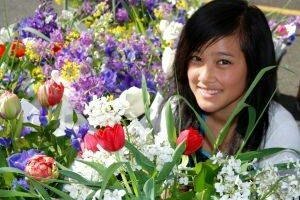 Since 1999 she has taught pre-kindergarten through 12th grade in public school, including experience with second-language learners, dual language and Montessori schools. Paul works at Denver Public Library and is pursuing further studies in the biological sciences. Paul, Jamie. 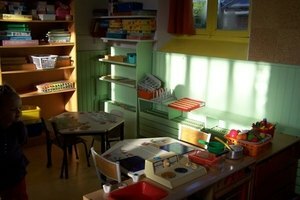 "How to Decorate a Preschool Classroom Using a HighScope Curriculum." Synonym, https://classroom.synonym.com/decorate-classroom-using-highscope-curriculum-8756602.html. Accessed 22 April 2019.